Long Beach City Council I-710 Oversight Committee, Gateway Council of Governments and The Project Committee all reject current environmental documents for 710 widening between Long Beach and East Los Angeles. Following thousands of comments from leaders within community health and environmental coalitions, the State-led project to expand the 710 Freeway from eight lanes to 14 lanes for 17 miles from Long Beach to the 60 Freeway in East Los Angeles was delayed. The Project Committee, am advisory committee to Metro, Caltrans and the Southern California Association of Governments, halted the project with an astounding “no” on the proposed routes. Meanwhile, the Long Beach City Council I-710 Oversight Committee recommended that Caltrans and Metro recirculate the draft EIR, allowing for more public comment. The proposal presented last week had problems beyond just concerns over induced traffic demand and air quality. It required moving power lines to line the banks of the Los Angeles River, interfering with service provider facilities including Shelter Partnerships, Bell Shelters, the Long Beach Multi-Service Center, and Seasons at Compton senior housing. The Gateway Cities Council of Governments (GCOG) understood this, and called for the EIR to go back out for public comment, another 90 days for the public to read, criticize and weigh-in, at a January 29th meeting. While community and environmental advocates are desperately fighting against the proposed widening plan, they aren’t just naysayers. Aided by a group of environmental groups, they’ve developed their own alternative. Community organizers were forthright in their desires at the public meetings. Despite praising state officials for abandoning two harmful alternatives, still asked that the Oversight Committee consider their “Community Alternative 7” within the upcoming EIR in addition to the other alternatives, mainly the no build, 6C (zero emission freight corridor with 10 lanes) and 6D (zero emission freight corridor with 8 lanes). Community Alternative 7–developed by a slew of organizations including the East Yard Communities for Environmental Justice, Communities for a Better Environment, Legal Aid Foundation of L.A., Long Beach Alliance for Children with Asthma, Natural Resources Defense Council, Long Beach Community Action Partnership, Coalition for Clean Air, and Physicians for Social Responsibility–proffers a committed zero-emissions design that includes a public transit element, biking/pedestrian elements, river improvements, and a public-private partnership for an employer-operated freight system which avoids the 710 expanding. 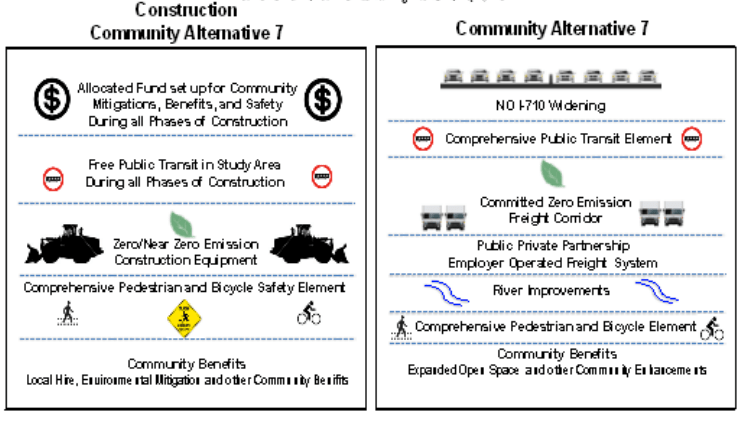 Their proposal was met with a yes (though not from CalTrans or the Southern California Association of Governments), as a follow-up meeting on February 1 by the committee took the recommendation to include Alternative 7. With more than 120 people in attendance, chants of “¡Sí se peude!” could be heard following the support of Alternative 7 from agencies ranging from Bell to Paramount, Port of Long Beach to South Gate. 7th District Councilmember James Johnson proposed a $10 million pilot project in the Port to test a zero-emissions catenary system, where overhead electrical wires power trucks–but ultimately failed in getting a second, in which a representative from Metro was quick to point out the process required for enacting early action projects. Of course, the action by this committee doesn’t automatically guarantee a recirculation of the draft EIR; that is ultimately left to a vote by CalTrans and Metro. ¡Sí se peude! — or we hope. The 710 doesn’t intersect the 60 in Pomona, but rather in East LA. I really like the idea of combining the freight-only corridor with no new general purpose lanes. The geometric improvements at interchanges are wins for everyone – compard to traffic light controlled diamonds, old school cloverleafs are dangerous for drivers because of the short weaves, and dangerous for bikes & peds because of the free-flow traffic. The community alternative seems really uninspired when it comes to transit. You produce an 832-page document, and the best you can give me is a paragraph on shuttles to transit centers, expanding Blue/Green service, expanding local/rapid bus, and local circulator bus? For a small percentage increase in cost, the freight corridor could include bus stations like the 110 (except they should be every mile, not every two miles). Electric buses could share the corridor with freight. Even a short headway like 5 minutes would only add 24 veh/hr – a negligible impact on freight capacity. At the south end, the line could turn west on PCH and eventually meet the extension of the Green Line on the Harbor Sub. At the north end, it would actually make the useless 710 Big Dig transit options very useful. It would capitalize on the traction power system and OCS that would be built for the freight corridor anyway, and again, at such a small increase in vehicles, it would barely impact the TPS requirements. If you wanted LRT, you could widen the corridor and put it in the median, like the 105. (You probably couldn’t put LRT on the same guideway as the freight due to the differences in traction distribution and return). You’d also need a new Green Line station at the 710 for transfers. This line would connect to Green Line (future), Blue Line, Green Line again, Gold Line, and Silver Line. Throw in the $50m BRT from the 710 Big Dig and you get another connection to the Gold Line. ¡Sí Se Puede! — or we hope.. esperar? or do you mean, Yes, they are puto? This is good news indeed. This is a project looking for a need. With the new Alameda and Alemeda East corridor improvements, most of the container trucks will be on trains and not on the 710 freeway. We just spent a lot of money adding new barriers, repaving and improving the 710 freeway, we will not need to spend any more for at least another 10 years especially since the container trucks will not be beating up the pavement. glad that groups developed this alternative. An even better alternative would be to replace one general purpose lane in each direction with a mandatory zero emission freight lane. Both the 710 expansion and the 710 extension could be replaced with a light rail (or BRT) running at least from the Green Line Lakewood station up to Pasadena. Connecting to both branches of the Gold Line, as well as the Green Line, will really help the transit connectivity of the eastern parts of the county. If it could even go all the way down to Cal State Long Beach that would be great. Long Beach and Pasadena will soon be connected by the Regional Connector, while SCAG is doing an alternatives analysis for the Santa Ana right-of-way. Both of these Measure R projects will address the transit issues in this part of the region. However, the 710 tunnel project you’re referring to addresses a separate regional issue for traffic trying to get around LA. As for this project, a complete widening of the 710 south of the 405 Freeway is needed, if only to match what the 710 north of the 405 already offers; anything beyond that would best be addressed by shifting container traffic onto the Alameda Corridor, which would be made more enticing through a direct ship-to-rail facility. The Transit Coalition is pushing for such a concept with its GRID Project campaign. The 710 gap will be built. I’m not surprise the local government committees rejected the 710 widen plan since it would take out a lot of business and home that pay property taxes. Both plans are good for the overall Southern CA economy. Both plans should be proceed as soon as possible. How will Light Rail move goods from the ports? Goods should be moved from the ports by freight rail. Alameda Corridor is being extended, and further freight rail improvements should be constructed. freight by truck in the first place. The answer to zero emissions is to electrify the Alamed and Alameda east corridor, not a truck lane. This keeps the disel engines away from the LA basin eliminating thousands of tuns of disel exhust from our air and many thousands of gallons of imported oil. Just replace one general purpose lane for this, one for busses, and leave the remaining few as a toll road, excluding the HOV lane. FYI..i think the 710 gap should be filled…so we can remove the 110 north of the 5 and reroute the 5 onto the 101 between the 10 and 60, as well as re1routing the 10 onto the 110 and 101 east of the 110. YAY FREEWAY REMOVAL. We should also remove the 2 stub, and the Marina freeway. Widening the southern 710 Freeway is not going to help Long Beach pedestrians and cyclists.